The first true road over the Sierra Nevada Range via the Donner Pass was known as the Dutch Flat & Donner Lake Road. The Dutch Flat & Donner Lake Wagon Road was completed by 1864 to assist with construction of the Central Pacific build the First Trans-Continental Railroad over Donner Pass. The website below goes into far more detail about the Dutch Flat & Donner Lake Wagon Road. In addition to the Dutch Flat & Donner Lake Wagon Road there was apparently two additional wagon routes that were apparently used; Coldstream Pass and Roller Pass to the south of Donner Pass. Both routes were apparently in use by 1846 when the Donner Party had reached Donner Pass. This site has some excellent links to maps showing all the wagon routes alongside Donner Pass Road in addition to the rail alignments. The Dutch Flat & Donner Lake Wagon Road became a state highway in 1909 with the intention of improving motor vehicle safety. The Dutch Flat & Donner Lake Road originally had an at-grade crossing of the Central Pacific Railroad at Tunnel #6 but that was replaced with a new underpass east of Tunnel #7 in 1913. The Dutch Flat & Donner Lake Road became part of the Lincoln Highway in 1913 and later the Victory Highway in 1921. The Dutch Flat & Donner Lake Road eventually was assigned as part of Legislative Route Number 37 in 1919. An interesting article about a winter snow race on the Dutch Flat & Donner Lake Road showing the crazy high grades can be found here. Ultimately the Dutch Flat & Donner Lake Road was replaced by Donner Pass Road in 1926 which became part of US 40. The Lincoln Highway continued to be actively promoted up until 1928 when US 40 signage began to be placed in California. The Victory Highway may have been promoted into the late 1930s but I can't confirm. The 1918 State Highway Map is the earliest I can find and it just shows a road going over Donner Pass but no route names. The 1926 State Highway Map doesn't show designations either but gives the surface conditions of the roadways. Donner Pass Road is shown as unimproved west out of Truckee to Donner Lake but graded over Donner Pass. Not much changed by 1928 when the Lincoln Highway about to go defunct. There are still no route designations but it is more clear what "is" and "isn't" considered to be a primary state highway is more clear. By 1934 all over US 40 over the Sierras appears to have been paved. The 1935 California Division of Highways map of Nevada County shows much more detail of Donner Pass Road and US 40 in their primes. Not much changed with Donner Pass Road until the Federal Aid Highway Act of 1956 which of course led to the Interstate system. The first visual change that can be seen on the state highway map with Donner Pass Road being bypassed is in 1960 when a new stub of I-80 is shown running from the Nevada state line west past Truckee to Donner Lake. The adopted routing of I-80 on Donner Summit appears on the 1961 State Highway map. On the 1965 State Highway Map Donner Pass Road is shown being bypassed by I-80 via Donner Summit, but US 40 still shown as present in California. It isn't until the 1967 State Highway Map that US 40 completely disappears from California. So with all that in mind I followed CA 89 south from Lassen Volcanic National Park and turned off of it at Donner Pass Road east of Truckee. As I mentioned in the CA 89 blog; Truckee dates back to the creation of the first Transcontinental Railroad which was opened in 1869. Truckee was apparently called Coburn Station and has been a hub of transportation in California ever since. Downtown Truckee has a classic Old California feel that doesn't feel quite as touristy as Lake Tahoe to the south. CA 89 followed US 40 from Henness Road west into Truckee back when it was signed in 1934. Donner Pass Road dips under I-80 several times through Truckee. CA 89 would have split south towards Lake Tahoe from US 40 at River Road. Oddly CA 89 is still signed from Donner Pass Road even though the highway is now multiplexed onto I-80. Donner Pass Road crosses over I-80 one final time. Donner Pass Road generally stays open during the winter aside from heavy snow fall. Chain restrictions to the Donner Pass Ski Area aren't uncommon. Donner Pass Road runs along the north bank of Donner Lake. Donner Lake is the location where the Donner Party camped during the Winter of 1846-47 and there is a Memorial State Park on the eastern shore. Apparently there was some sort of Volkswagen cruise going on that became very apparent at the start of the climb westward towards Donner Pass. The Southern Pacific tracks can be seen high above to the south. The climb to Donner Pass has various wide open vistas amid the granite rock face. 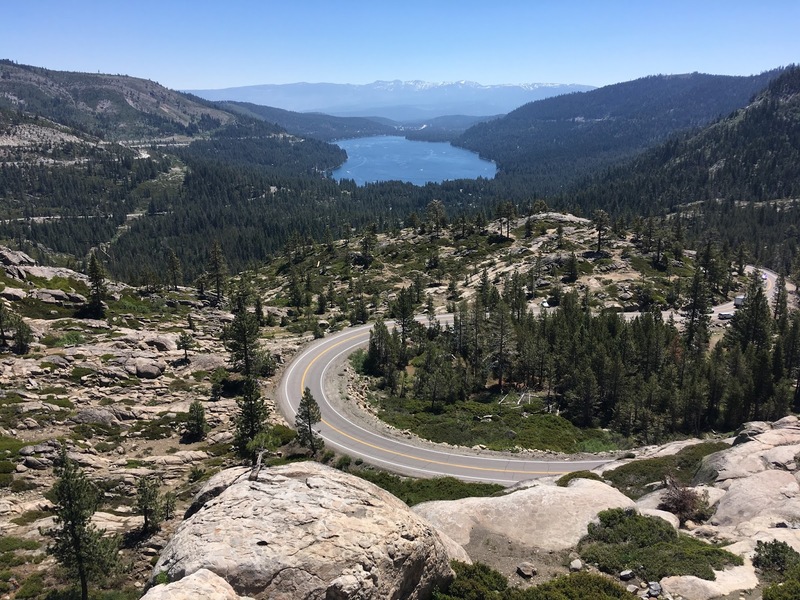 The views are wide but Donner Pass Road isn't narrow or much of a harrowing drive. It is easy to see why Donner Pass Road had such a long service life as the Lincoln Highway and US 40. Near the top of Donner Pass the abandoned Central Pacific rail tunnels overhead are obvious from Donner Pass Road. There are some hiking trails that actually go to some of the abandoned tunnels. Just above the train tunnels the Donner Pass Rainbow Bridge comes into view. The Rainbow Bridge was completed in 1926 and is considered to be one of the most beautiful bridges in California. There is plenty of historical reads to be found near the Rainbow Bridge. Donner Pass Road has one of the best views of the Sierras. Ahead from the overlook left to right the following can be seen; I-80 descending Donner Summit, Donner Pass Road, Donner Lake, and the Southern Pacific Railroad. There are even some haggard old signs that probably date back to the service era of Donner Pass Road. 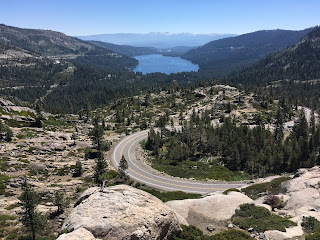 The final climb over the Rainbow Bridge to Donner Pass narrows slightly. Donner Pass is signed at 7,135 feet above sea level. Donner Pass Road passes the aforementioned Donner Pass Ski Area before reaching I-80. Donner Pass Road actually continues north of I-80 as a frontage road but I jumped on the Interstate to return to CA 89. I stopped at the Donner Summit Rest Area to check out some of the memorial.